Plug-n-Play - The onyX is compatible with a large variety of XM accessories and kits. You can add a boombox or home kit to your order and truly listen to XM anywhere. 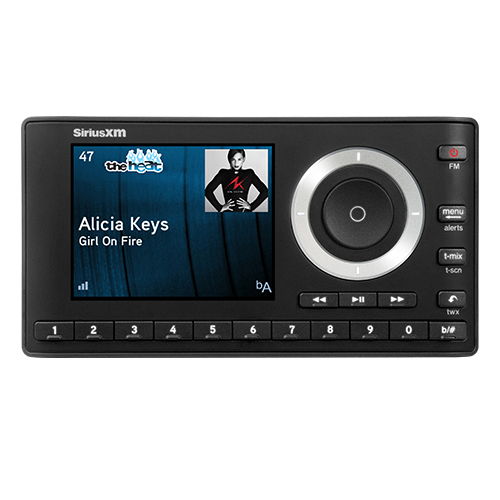 Introducing the SiriusXM™ OnyX Plus Satellite Radio receiver with vehicle kit. This beautiful, full-color display receiver features pause and rewind capability, along with album art display. This unit replaces the Xpress RCi and Edge receivers as the top-of-the-line SiriusXM Satellite Radio unit. With more features than there is room to list, this is THE satellite radio to have. The onyX Plus receiver also includes PowerConnect technology which provides crisp clean sound when using wireless FM transmission. This allows the FM Transmitter to work through your vehicle's radio creating an easy Do-It-Yourself Installation and a clear sound.